Halo: Initiation #3 is the conclusion to the three-part series focusing on Commander Sarah Palmer’s transformation into a Spartan-IV. If you’re in to mobile games, it appears that this ending will lead directly into Halo: Spartan Assault. 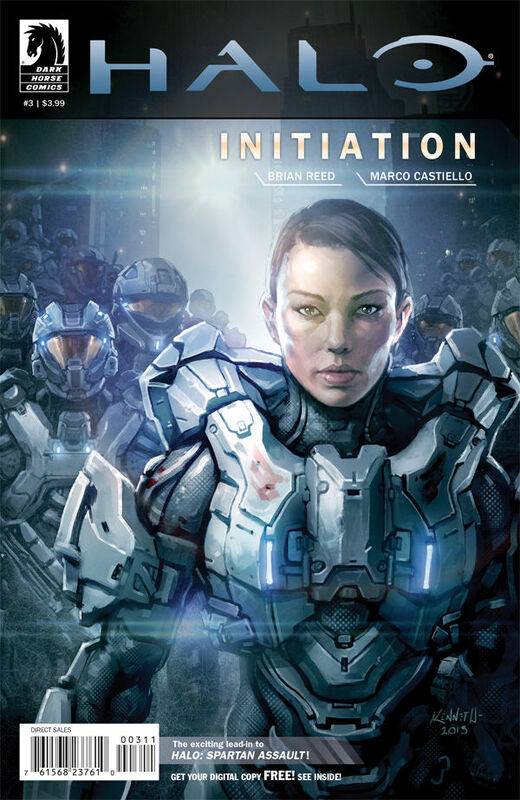 Check out my reviews of the first two Halo: Initiation comics here. The voice of the writing style is still 80s action movie, which is just fine with me. The art is still really ugly, but the spaceships and armor look awesome. The cover, on the other hand, is gorgeous enough to frame. I LOVED that the big boss battle was between two super-strong, non-sexualized women. That was just a treat. All-in-all, I’d recommend this little three-part romp to fans of the Halo series, military-themed comics, or anime. I hope to see more video games flesh out their female characters like this! Sarah Palmer and her new comrade Spartans are thrust into action when a violent insurgent group attempts to seize the UNSC flagship Infinity. Is their Spartan cunning a match for the insurgents’ brilliant guerrilla tactics?